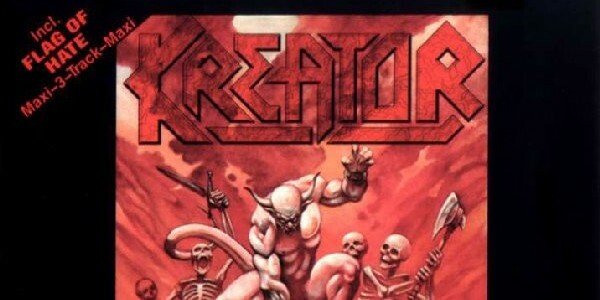 A landmark moment in thrash history, this precociously vicious shitstorm instantly struck a chord with thrashers worldwide as Kreator found themselves suddenly leading the way in the Teutonic scene. An inspiration to countless bands – grindcore legends Napalm Death covered “Riot Of Violence” and even they couldn’t match the intensity and ferocity of its original incarnation – Kreator’s proto death metal slab of pure evil was a shock to even the most hardened thrasher. Here was a band who not only competed with the likes of Slayer and Metallica but took thrash to another level entirely, one where endless pain was guaranteed and new levels of brutality were being explored. Unhinged to the point of incarceration, Pleasure To Kill‘s track-list borders on a greatest hits selection with the wall of noise maelstrom of “Ripping Corpse”, the unforgettable “Pleasure To Kill”, the death metal influencing “Riot Of Violence” and the epic and surprisingly complex “The Pestilence” all meriting immediate classic status. Kreator altered not just the German thrash landscape with Pleasure To Kill but thrash metal (and death metal) in general and, frankly, mayhem of this calibre never sounded so good again! Honourable mention: 1989’s Extreme Aggression would prove to be Kreator’s commercial peak and warrants particular mention!